Judy Joan Gillcash, 60, of Moncton, passed away at The Moncton Hospital on Friday, August 3, 2018. Born in Moncton, she was the daughter of Dale and Joan (Crossman) Garland of Moncton. Judy worked at the Fabric Cupboard Quilt Shop. She enjoyed quilting, crocheting and cooking and she absolutely loved to travel and spend time at the family cottage in Targettville. But most importantly, was the time she spent with her family, especially her grandsons. Judy will be sadly missed by her husband, Danny Gillcash of 39 years; daughter, Heidi Wallace (Josh); son, Brad Gillcash (Dawn); grandsons, Jordan, Connor and Blake Wallace; sister, Susan Gogan (Dan) and brother, David Garland (Cecile); several nieces, nephews, extended family members and friends. By Judy’s request, there will be no visitation hours or funeral service. 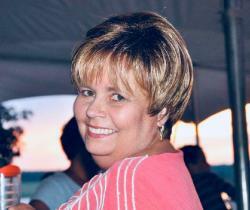 In Judy’s memory donations to the Pregnancy and Wellness Centre Moncton would be appreciated.